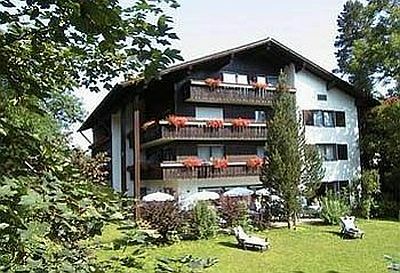 Schwangauer Hof Hotel is a comfortable middle class bed and breakfast hotel close to many attractions. Located in Horn, a district of Schwangau, the hotel is a budget place to stay when you visit Hohenschwangau and Neuschwanstein castle. The hotel is about 7km from the motorway A7 exit Füssen. In Füssen take the federal road B16 first, and then the B17 into the direction of Schwangau. 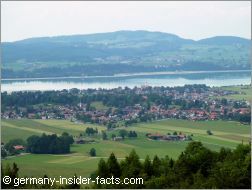 Horn is located between Schwangau and the royal castles. The closest train station is in Füssen, then take the bus 73 or 78 to get to Horn. These are the same busses that bring you to Hohenschwangau and Neuschwanstein castle. The hotel is located in Füssener Strasse, right in the town centre. The hotel offers 25 rooms with ensuites, equipped with either bath or shower and WC. The "Swan room" is a family apartment, and there is one single room accessible by handicapped guests. Schwangauer Hof has a lift, so it is no problem to reach the upper floors with your baggage. Rooms have either a balcony or a terrace. The lovely garden invites you to have a rest after the sightseeing. Schwangauer Hof Hotel is a non-smoking house. The hotel has no restaurant, but breakfast is served in the house and is included in the price. Reception is open from 07:00am to 10:30am and from 03:00pm to 08:00pm. If you arrive later than 8pm call the hotel in advance to make arrangements. Many hotels, restaurants and other services in Hohenschwangau have their opening times / reception times adapted to the opening times of the castle. Be aware of this fact to avoid disappointment. If you are looking for a bit of nightlife, you'll better check into a Füssen hotel. Click here to learn more about the Hotel Schwangauer Hof and book your room. Below are more options for accommodation in Schwangau. Enjoy your stay in this beautiful corner of Germany.